The other day, I was on the R Train slowly winding my way to the office when I noticed the guy sitting across from me had a canvas tool bag next to him. Not just any canvas tool bag, mind you. 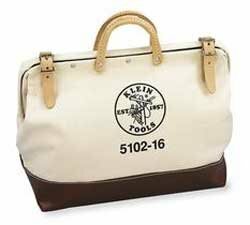 Oh no, Chickens ... it was a Klein canvas tool bag. A few minutes later, this guy opens the tool bag and starts digging around. I'm thinking, "Friend, what have you got in that tool bag that's *so* important that you need to get it out while on the train?" I'm not gonna lie to you - I was surprised by what happened next. He pulled out a full Turandot score, popped in his headphones and commenced to listening. Now, before you pass judgment on my taste (or lack thereof) - listen up! I have it on good authority that tool bags (Porter is another good one) are on-trend for spring/summer. And, when I say I have it on good authority, I mean that I got the info from someone who knows better (the ever-flawless Stylist / PR Guru / Miracle Worker, Amy Keller). As evident by the fact that this-very-day I am wearing Old Navy khaki cargo pants from 4 years ago, the on-trend factor is not what drew me to these bags. I'm the crazy guy who is obsessive about keeping his opera scores clean, dry and free from the muck and mire that can collect on them. What better way to feed that obsession when you're back and forth between rehearsals than with a canvas, moisture resistant bag? You judge - you know you do. But, I'm telling you that when you get home and your score is clean and free from nastiness, not to mention all of your other goods ... you're gonna thank me for it.